Don't have a sled? Improvise! It's perfectly acceptable for your dog's breath to smell like dog food or a treat they recently ate, but what about when it smells like old food or worse? Since dogs don't brush their teeth or chew gum like we do, it's up to us to make sure they have healthy gums and teeth. Depending on how passive and well-adjusted your dog is, you may be able to brush their teeth regularly to help remove stuck food and give them crunchy treats that help prevent plaque build-up. However, if your dog isn't ok with sitting still and having his/her teeth brushed, you may have to opt for having a vet do a cleaning. Even if you brush regularly, your dog's teeth will need a deep cleaning/scraping by a vet at least every couple of years in order to keep gums healthy. Maintenance of your's dog's diet is important for his/her breath. If your dog eats wet food, try tossing in some crunchy kibble to help eliminate the possibility of old food getting stuck in the teeth. Some dog foods even contain ingredients that help control bad breath. You many want to switch to a higher quality food than you're feeding, one that has no fillers. On the other hand, too much meat can create unnecessary deposits of food. 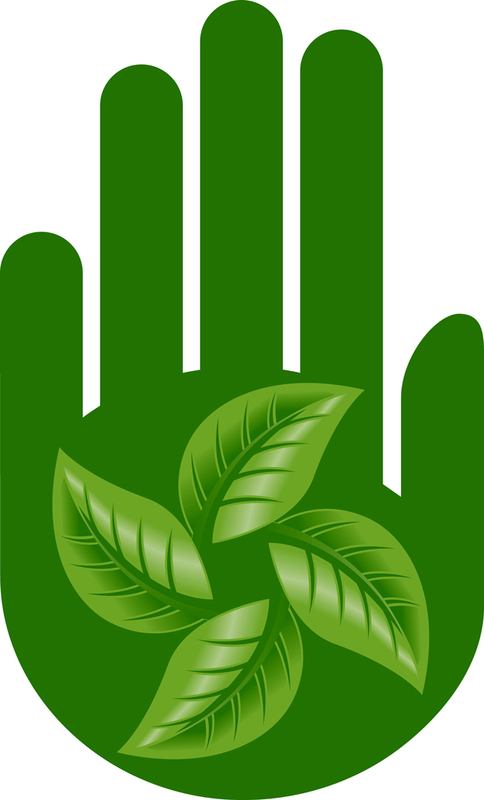 Look for a balanced commercial food with meat or fish, grains and vegetables. You can also cook for your dog (again essential ingredients are a balance of animal protein, grain and vegetables). Dogs are omnivores, so they need a mix of several kinds of food. You can also try adding vegetables to commercial foods; also, make sure the food bowl is cleaned between meals so there are no deposits of old food. Spoiled food can give your dog both bad breath and diarrhea! Some dog treatas contain parsley and mint that can help clear bad breath and improve the health of a dog's digestive tract. Sometimes bad breath is the result of poor digestion, so talk to your vet about changing your dog's brand of food or his/her whole diet. Your dog's diet should support healthy coat and skin, and normal pee and poop. Regular exercise can also help maintain a healthy digestive tract; and drinking water regularly loosens up particles of food stuck between the teeth. However, if you notice red or swollen gums, brown, stained, or loose teeth, make a vet appointment for a dental check-up right away. You'll be glad you did. 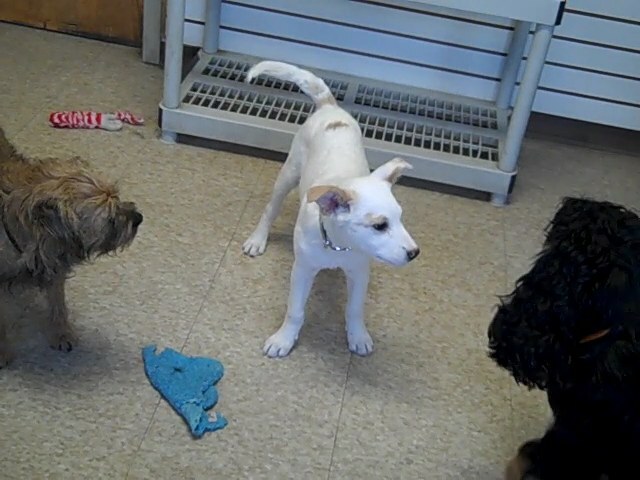 The little white puppy is Pixi and she doesn't take any guff! Only 15 weeks - imagine a year from now?? Ruby turned 6 on November 21st but we just got to do her birthday today. She was so eager for her treat that it was difficult to get her party hat on! Bailey the blond mix and Louie the boxer were glad to have a birthday party for two. Louie was more excited about his treat than Bailey who has a thing about looking gift (horses?) in the mouth. Today the pups in the medium dog play room decided to work off some weight to make room for turkey. Take a look! A guy gets popular fast when it's birthday ice cream time. Chester was hard to get focused, but once he got the jist, he was 100% party boy! And he had LOTS of friends. Archie is a debonair fellow who loves the good life. Look how he enjoys his birthday Frosty Paws! At first he wasn't happy about having to share, but he came around, at least for a few licks. Don't miss this behind-the-scenes look at preparation for trick or treating at The Doggie Den. Some pups are hams, some get embarassed, and others head for the hills! It was a fun day. HAPPY HOWLEREEN EVERYBODY! A new study in Veterinary Biology is the first to confirm that canine influenza virus (CIV) H3N8 easily spreads from infected dogs to other dogs. It also showed that CIV can cause more serious forms of respiratory disease in dogs, such as pneumonia, that often go undetected in clinical practice. Cyndy Crawford, DVM, Ph.D., University of Florida College of Veterinary Medicine, Clinical Assistant Professor of Shelter Medicine, and a leading expert on CIV, said, "This study is important for several reasons. First, it provides clear evidence that CIV H3N8 is highly transmissible between dogs, confirming field observations recorded during naturally occurring canine influenza outbreaks in confined populations of dogs. Second, the finding of subclinical pneumonia in nearly all infected dogs in the study underscores the virulence of this virus in both the upper and lower respiratory tract, predisposing many dogs to serious overt pneumonia requiring hospitalization." In addition, researchers confirmed that the excretion of the virus (shedding) precedes the manifestation of clinical signs. This is significant, according to the study, because it demonstrates that apparently healthy dogs can infect dogs they encounter at kennels, clinics, shelters, training settings, shows and other locations where they congregate. 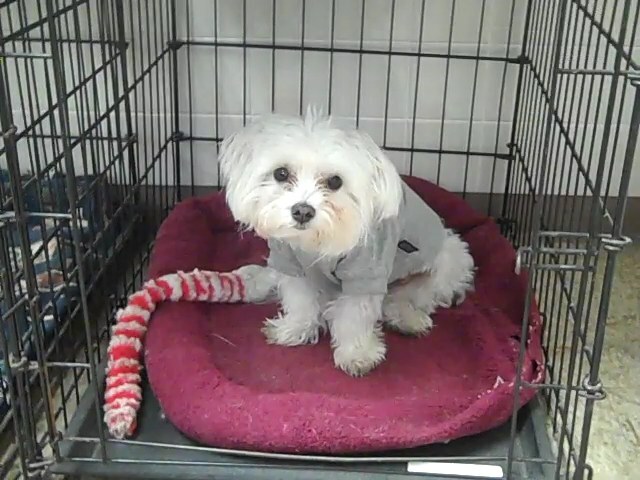 Researchers also found evidence of "rolling" infection, which makes if difficult for infected kennels and shelters to eliminate the infection unless they close down, and keep new, uninfected dogs from entering, according to the researchers. These locations can also become sources of disease with the potential to spread to other facilities. (...) one of the authors of the study said, "We know that canine influenza, a new disease for many veterinarians, is often under- or misdiagnosed because clinical signs are often similar to other respiratory diseases. Our research further suggests that infected dogs may have serious lung damage that goes undetected because it does not manifest as pneumonia." 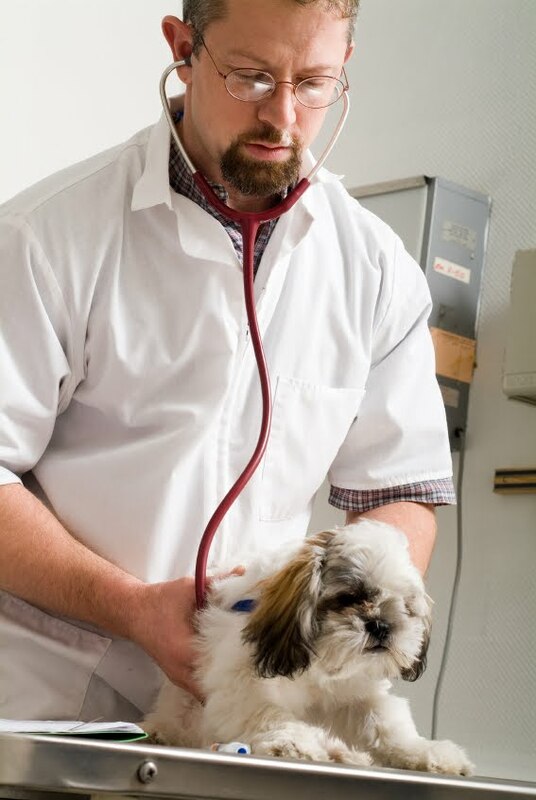 Study authors concluded that many more dogs with CIV are likely to have lung damage not being detected clinically in veterinary practice, particularly compared to canine cough, which rarely leads to serious respiratory disease. 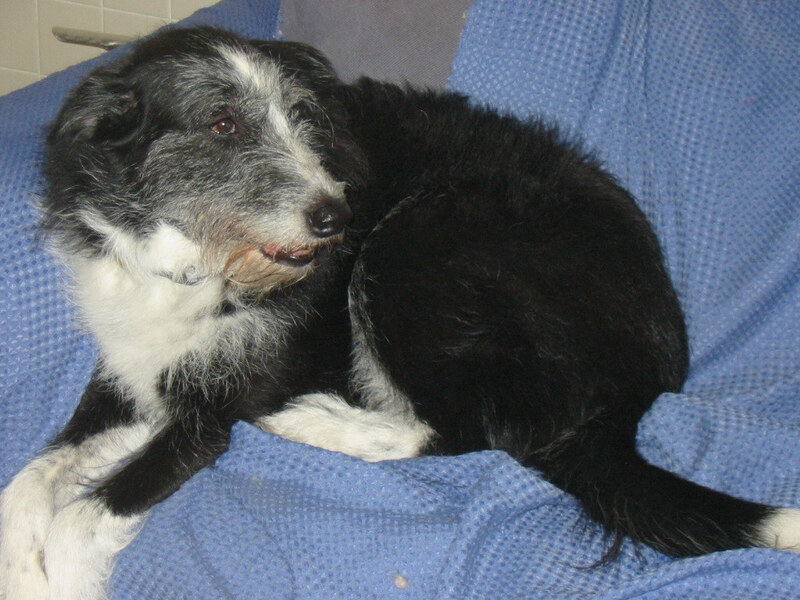 Cleo is our October Dog of the Month. 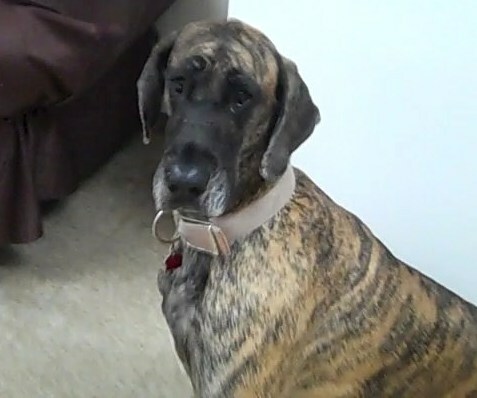 She's a very special, beautiful Great Dane. Also the very definition of a gentle giant. She loves to lean against you and be loved, but only once she gets to know you. And that usually takes weeks! Definitely a conflict avoider too with her puppy pals. Cuba is the sweetest girl in the world. Her 10th birthday is Oct 21st, but we goofed and celebrated today, Oct 4th. She saw the Frosty Paws treat and was too smart to correct our mistake! Anyway, Happy Birthday for all of October, Cuba! Belle is one of a family of two yorkshire terriers. Her brother is Milo. 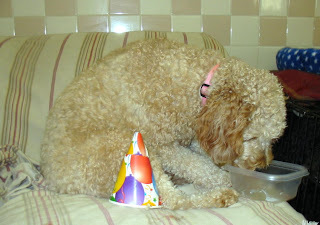 She recently turned 5 and Milo and her Doggie Den playpals were there to wish her many happy returns. She was a gracious hostess, allowing everyone a taste of her treat. 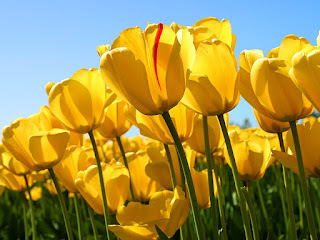 My name is Duke and I follow this blog, NOT because I'm loyal. Because I gotta know what's goin' on! My playpals get treats, ice cream, movies and facetime; and if'n I dint watch out I'd never know. Susan knows I'm on the lookout now, though. Where's mine, Susan?? BTW, you can see I'm a very tough guy. Doggie Dry Nose - Sign of Illness? My dog's nose is dry. Is he sick? may be very wet and cool one moment then be warmer and not-so-moist the next. All in the course of a day. All perfectly normal. by your veterinarian sooner rather than later. such as: lethargy, decreased or absent appetite, vomiting, diarrhea and so on. (skin) problems that can be seen in this area, such as Pemphigus Foliaceus. seen commonly in orange tabby and calico cats. 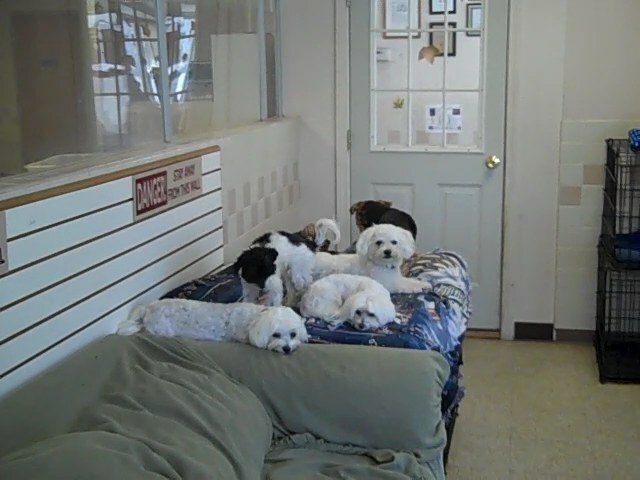 After a busy morning of play and hourly forays to the outdoor pee pen, the little dogs take a nap in the afternoon. In case anyone wonders if dogs are pack animals, you might notice how they're practically on top of each other, with just one tiny Furby girl enjoying a big couch! 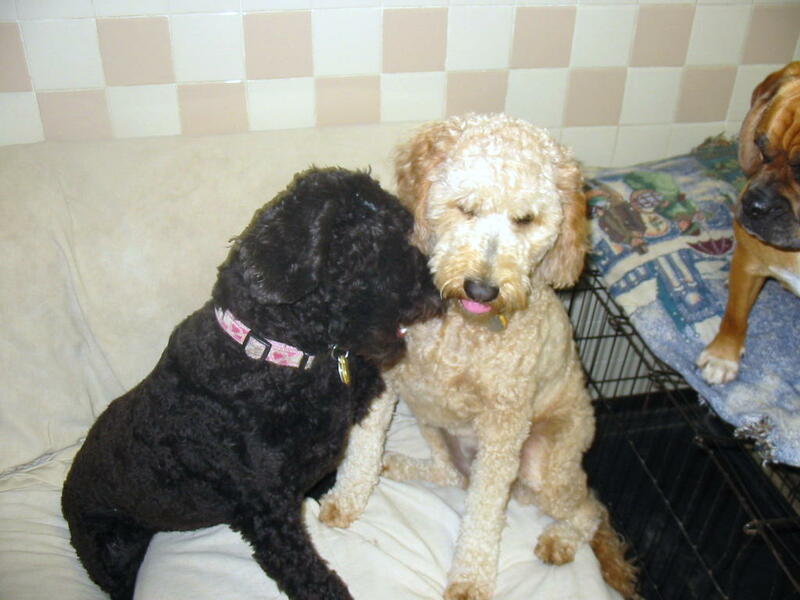 Raven and her sister Java are goldendoodles who love life and can jump like gymnasts. At Raven's second birthday party she woofed her Frosty Paws treat, but was nice about giving Java a few licks. And of course, there were sundry interested by-standers! What to do about excessive barking? Many frustrated dog owners find themselves trying to decode the reason for their dog’s excessive barking. It's a lot like decoding the crying of an infant. Breeds such as terriers can make themselves sick from excessive barking, which may even be a part of their nature. Other breeds just bark without apparent hard wiring for it. 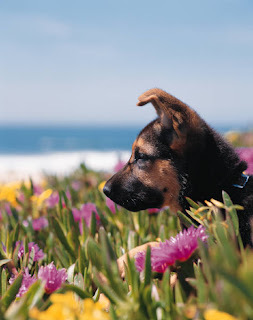 Often the dog senses danger; is joining in with unseen barking dogs that the human ear doesn't hear; is attempting to capture the owner’s attention; or the dog has a need and the owner is not addressing it. Familiarizing any breed of dog with the noise environment he or she is likely to encounter routinely can be a long process; yet it’s required if a dog owner wants to get any sleep. Neighbors, neighbors' pets and other animals should become so familiar to your pup that he or she doesn't feel the need to bark when they make known noises. The best way to "desensitize" your dog to safe noises is to take her or him to the source of the noise and praise them when they calm down. Neighbors can help by greeting your dog quietly each time - they don't want her or him barking excessively either! Another way to deal with barking at routine noise is to establish a release word which, when you say it and your dog stops barking, gains him or her a reward. On the other hand, dogs usually feel threatened by strangers, which is a good thing, for they can alert their owners to potential intruders. 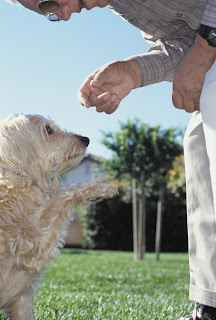 These instances should cause you to praise your dog, then say the release word when you want him or her to stop. In additon, barking often signals an attempt to capture your attention in order to engage you in activity or just get some affection. It should be noted that many breeds require more attention than owners are able or willing to provide. For this reason it is suggested you research your breed of choice before purchasing. Owners with children may find this less of a problem if the children regularly engage with the animal. Some breeds require extensive exercise and activity. An owner may be unaware of the dog’s need to run outside of a confined area, resulting in the dog barking excessively. This is easy to recognize; your dog will run back and forth barking; or try to escape. Owners are advised to provide at lease one hour of exercise daily to ensure that their dog is receiving the exercise he or she requires. Exercise provides a dog with a greatly needed outlet for huge amounts of energy which otherwise would get used through barking. 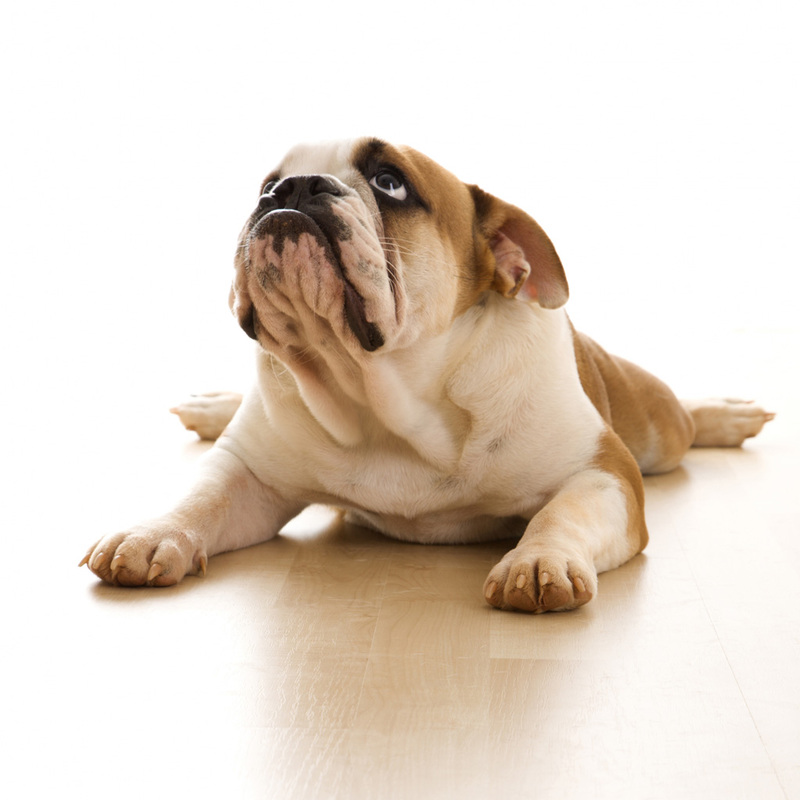 A last ditch method of controlling barking may be to keep the dog indoors except during exercise and potty times. There is also the option of using an anti-bark collar. However, with these strategies, you run the risk of the dog associating being indoors with barking. Or, in the case of the collar, confusing the dog when he/she wants to bark to alert you to a potential intruder, or to tell you he needs to go out. The best way to solve this problem may be training classes or consultation with an expert of the particular breed. Content provided by Gary Hamilton of ohmydogsupplies.com, the top ranked store to find unique dog collars online. Redaction and editing by Susan LaDue. Furby and Sam Celebrate YUM! Furby times 1 plus Sammy times 4 equals tons of birthday fun. Furby's the little black and white girl tucked under Laurie's right hand and Sammy's the guy woofing down his treat on Laurie's left. Lady and Quinn are our beagle sisters; they're sweet as can be and share everything with one another. We call them our twin bagels. 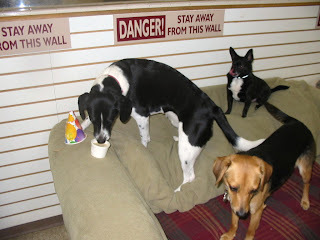 Lady was woofing her way through her birthday Frosty Paws when Quinn stood up to partake. 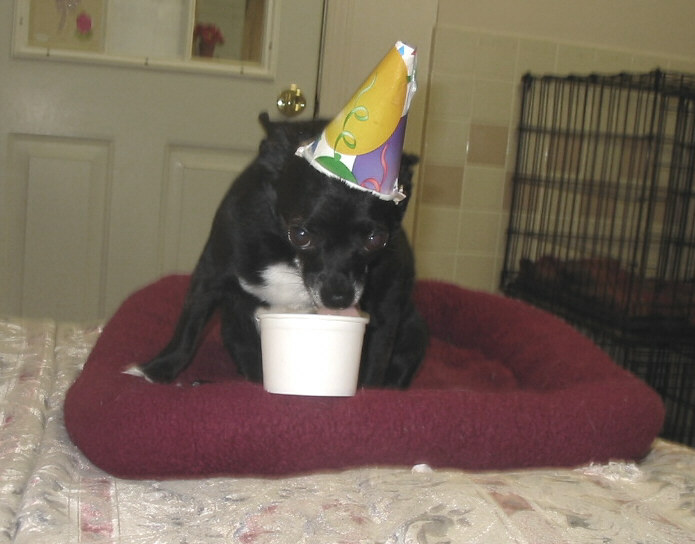 Emmy's a good sport about wearing a party hat, but sharing her Frosty Paws with her playpals is not her idea of a birthday! Happy 3rd, anyway, sweet Emmy! Ebby has turned 7 and she's quite a lady about birthday treats. She doesn't do competition. If one hands her a tidbit, and only to her, she will eat daintily. If others barge in, well, that's just beneath a girl of her class. Even if you're looking for a purebred. At any given time, a significant percentage of the dogs in a shelter are purebred and awaiting adoption alongside their mutt counterparts. Besides, looking at the mixes that are available for adoption can either confirm your decision to look for a purebred, or change it. Ask your vet or contact local breed clubs to find the most reputable in your area. Be sure to visit the facility to see where your dog was born, whelped and exercised. If possible meet your prospective dog's parents. DON'T BUY YOUR DOG ONLINE OR FROM A PET STORE!! It's most likely going to be from a puppy mill. Dogs born in puppy mills tend to have more health problems due to the poor conditions into which they are born, and in which their mother lives. Even if the nearest group for the breed of dog you seek is cross country. 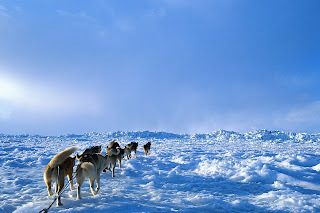 Oftentimes, they'll help arrange transportation in order to get the animal to you. Reprinted from Angie's List Magazine, August 2010, p. 64. It ROCKS in the medium dog play area at The Doggie Den. No slackers, everybody's up and about. Dinero and Clancy are both determined to win the tug of war and Chester, he's into "fetch". Eva and Charlie just want to be part of whatever's happnin'. expensive health problems. Being a dog owner is daunting, though lots of fun. 1. Do not leave your dog alone for long periods of time. This should be the most important factor in your decision whether or not to get a dog. Particularly as puppies, but all through their lives, dogs are bored, anxious and/or depressed when they're alone. They are pack animals and pets see their people as their pack. If your life style obliges you to be away from home for 10-12 hours a day, don't get a dog! It's not fair to him or her;and you're likely to find yourself stuck with behavioral problems like chewing on furniture, soiling the house, chewing on themselves, excessive barking and on and on. 2. Clipping your dog’s nails – it is very important to get your dog’s nails clipped every couple of months. If you do it yourself, make sure that you know how. Cutting into your dog's vein is painful and will cause him or her to bleed profusely and to avoid you in the future if you have a clipper in your hand. You can get a good clipper from a grooming shop but if you are hesitant, you can also bring your dog to a dog salon or to a veterinarian but of course, you will be spending a few dollars on it. A well manicured dog can walk easily, without hindrances. A dog with long nails has to constantly compensate for the awkward angle his toes are forced to assume. 3. A good bath every 6-8 weeks – it is important to bathe your dog to make his fur shiny and clean. It will also Keep him/her free from diseases and pests. You shouldn’t forget to wash your dog’s face, eyes, and ears since these areas are the most important ones to keep them healthy and free from pests. 4. Keep a balanced diet – there are dogs that eat anything they see, which will eventually make them sick. You need to watch what your dog eats; make sure that he or she gets an adequate type and amount of food. If you only rely on processed foods, you need to very particular about the brand, since these foods usually contain unhealthy preservatives. READ THE LABEL and remember that most of the food is made up of the first two or three ingredients listed. You should look for dog foods that contain vitamins, minerals, pro-biotics and antioxidants. These are good because they boost the canine immune system, helping to keep dogs healthy throughout their lives. Most of all do not overfeed your dog!!! 5. Exercise your dog - this is the one people slack off on over the months and years. Yet it may be the most important thing you can do to keep your pet physically and psychologically well. Dogs with behavior problems often get better with increased exercise, because the lack of it makes many breeds nervous, bored, anxious and generally prone to bad behavior. Long, brisk walks on-leash are excellent, as are unleashed workouts in a fenced-in area where you can play fetch or just encourage your dog to run around for half an hour or so. If your budget allow, put your pup in doggie daycare a couple of days a week. Information provided by Kelly Dawson - for more dog information by Kelly, take a look at airline approved dog carriers & labrador retriever from animal-world.com. You won't believe this morning pee! It's been a long night and a guy needs to take his time with his first pee. Plus it can be boring if you don't get creative! Cody turned 7 on July 10th. He's our all around good guy who likes everybody.... provided they don't come on too strong. Definitely more a lover than a fighter. In the end he even left some Frosty Paws treat for his pals. Some dogs hang out by the pool; some dogs wade in the pool; some dogs dig in the pool; aaaand, some dogs, well, you'll see. Most people refer to me as a "mini Huskey" but ahemmm... I am my own breed and I'm very fancy. Klee Kai. I'm extremely shy; yet Susan insisted on pointing that black box thing at me for what seemed like forever! 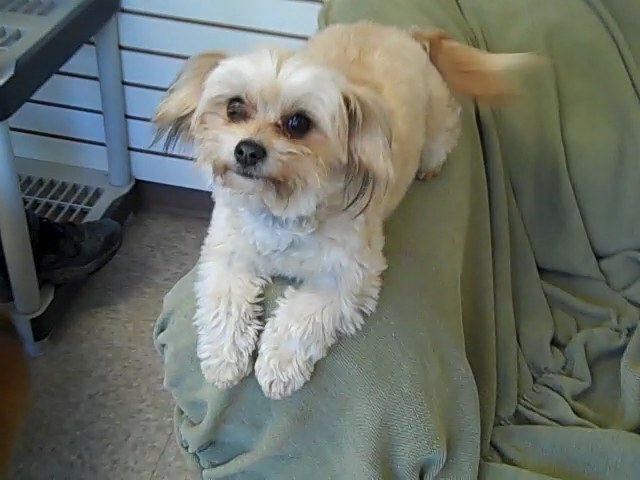 Lucy is a chihuahua/maltese mix and she's as cute as a button. Maybe that's why she's 2010's May Dog of the Month - her little face is as welcome as the fresh spring flowers. She LOVES to play - The Doggie Den's May Sweetheart!! Molly insisted that Susan hold her birthday treat while she licked it. She didn't mind at all when friends decided to join her. Happy birthday, good girl Molly. If your dog chews on any of these plants, ask your vet's advice immediately as to whether your pup should receive medical treatment. Simon loved his birthday treat. When he felt pressure from Archie the pit bull pup he simply picked up his dixie cup and relocated. His sister Samantha didn't want to spoil her dinner, so she decided to bury her treat... saving it for later. What can we say? Everyone loves a party. 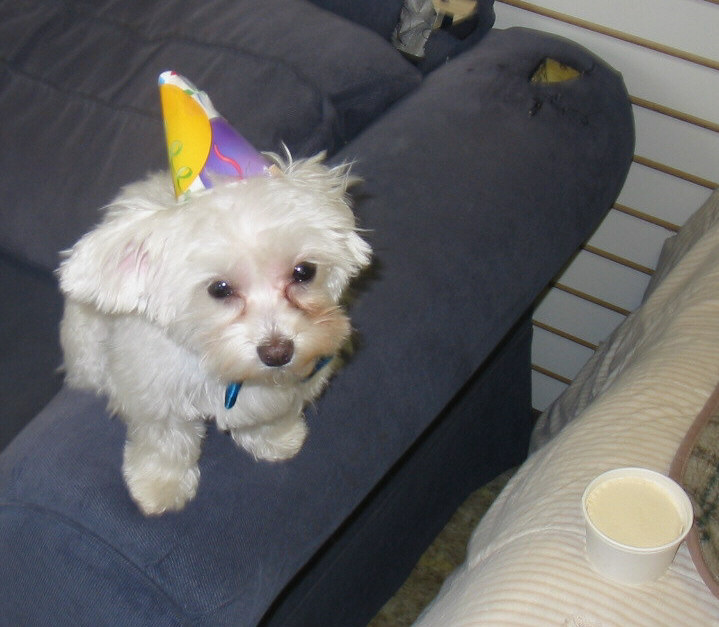 Watch Yuki and his puppy pals enjoy an awesome birthday cake! Molly was able to slurp her Frosty Paws treat in peace, though she did have attentive friends in Floyd the basset, Atrayu the sheepdog, Crosby the puggle, and Benny the cocker. Charlie is one of our sweetest guests. He walks away from vociferous encounters and plays with those who are gentle. He loves human attention and preferred to have his birthday treats hand fed, so that's Laurie's people paw you see on the right. Happy 1st birthday, Charlie! Sometimes even we macho guys get tired! 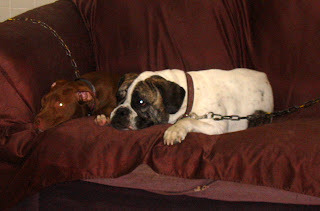 Pete the bulldog mix and Dinero the pit bull take a break while waiting for their moms to pick them up. Ringo, the Olympic puppet, can work it all day long, entertaining her canine and human friends no end. Peso may be a chihuahua, but when it comes to defending his birthday treat he's a BIG GUY, He couldn't get the treat down fast enough. And 'though we'd never heard him growl before, he gave off fierce noises when anyone else tried to share his birthday bounty. Happy Birthday, dear Peso! A relatively new disease, canine influenza was first reported in Florida in 2004, but has now spread to 30 states and the district of Columbia. Most dogs have no natural immunity to it because it is a newcomer on the infectious virus scene. It's transmitted by direct contact, like licking and nuzzling; and through the air via coughs or sneezes. Your dog can also get it as a result of contact with contaminated surfaces, such as the hands or clothing of a person or the coat of another dog. So if your dog is exposed to a multi-dog setting (daycare, kennel, dog park, dog classes), you should talk to your veterinarian ASAP. There is a vaccine, but only your vet can advise you as to whether you should vaccinate your pup. The symptoms of canine influenza are a lot other respiratory diseases: cough, nasal discharge, watery eyes, loss of energy and/or appetite. However, the canine influenza cough can be persistent and sometimes leads to pneumonia, which can be fatal. The vaccine should be administered along with a bordatella (kennel cough) vaccine. Neither of the two preventatives can protect your dog from 100% of respiratory diseases, but together they go a long way; and if your dog does develop kennel cough or canine influenza, he or she is likely to have a milder case than an unvaccinated dog. Little Duke loved the birthday attention, but didn't think much of his Frosty Paws treat. However, he guarded it faithfully until Betsy the cocker spaniel managed to edge it away from him gently. Welcome to SPRINGTIME, all you north-of-the-equator dwellers. Welcome to muddy lawns, promising sun, the insect avant-garde, crocus buds, daffodil shoots... and most of all DAYLIGHT SAVINGS TIME! What a joy, leaving work while it's light out. Every year it seems a miracle. Dogs love springtime too. More smells, yum! Especially all the rotten stuff that has fallen out of the melted snow. Those of us who run dog daycares brace for unwelcome bouts of doggie diarrhea in the spring. Lots of bad germs on the ground and in the ground water. Some of the bad stuff smells like food to dogs, so it's important to supervise your dog very closely when he's loose in the yard or at a dog park. You'd be amazed at some of the stuff they love... or maybe you wouldn't! We find half decayed carcasses of small animals like squirrels, rabbits and chipmunks in vomit and poop. Thank heavens dogs have short intestinal tracks and can poop out stuff that would kill us 2-leggeds! Still, it's unpleasant. We tell our daycare owners to keep an eye on their pup if she or he has diarrhea and to get to a vet with a sample if things aren't back to normal in 24 hours. Bacterial infections and parasites are not uncommon this time of year. And oh yeah, don't forget the flea and tick treatments! If you stopped for the winter, it's time to start up again. In our grooming shop, we're seeing fleas and ticks flashing "go springtime!" grins. They're waking up and they're HUNGRY. Clancy the yellow lab loves to tease his playpals Dinero the pitbull and Chester the Wheatie. He offers his bone but will he let it go???? This was Bruce's first birthday at The Doggie Den and he wasn't sure what to do about all the competition for his Frosty Paws treat. So we tried crating him... thinking he'd feel safer. NOT!! Finally we held him and his treat and he ate some of it. Molly in front of him, running interference. If there's any leftovers, Molly's intentions are clear. Then there's Peso the black and white chihuahua who just sighs and licks his lips. Lenny the German Shepherd turned 2 today. Wanted no part of his party hat but he sure tucked into his treat. Hid it in the corner of the couch and surrounded it with his whole body, like a convict protecting his dinner! In the end, though, he yielded a taste to his friend Simon, the brindle colored chow who moves in at the end. Rockin: Dexter the black and white pitbull mix. Cruising: Cuba the black and white long hair mix; Rusty the tan shiba inu; Cleo the great Dane; Simon the brindle chow mix; Zack the golden retriever. Resting: Bailey the tan and white shib inu mix; Olivia the tan lab mix; Lenny the German shepherd. Sleeping: Floyd the basset and Fern the chocolate lab. 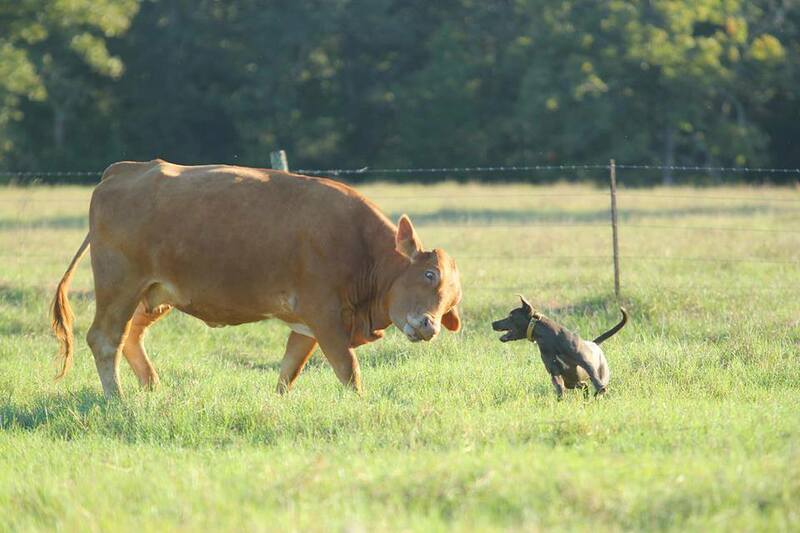 They may be little but they know how to rumble! Belle and Milo are brother and sister. Belle is the older and she wasn't too sure about this sibling thing when Milo arrived on the scene. Milo is the guy with the formal attire, by the way. Anyway, Belle (lying down) got used to having a little brother and now acts the immensely tolerant and put-upon older sister. 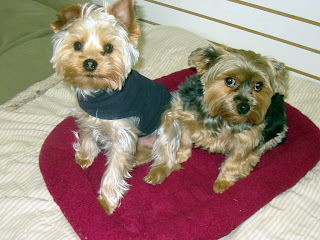 They are a great addition to The Doggie Den family! Doggie paws get cold too! Just a hint - salt and dry cold damage pup's pads. You might notice him/her licking the pads; or perhaps you'll see little cracks. 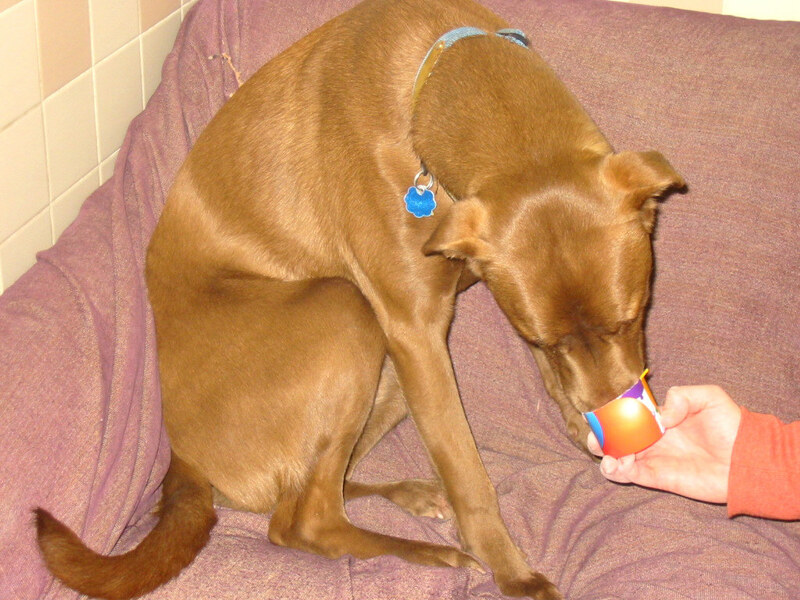 In deep cold it's a good idea to periodically lubricate pup's paw pads with Bag Balm, vasoline, or vitamin E oil. Baby oil and mineral oil work okay too. Rub it in to each pad well so s/he can't eat it. And if he or she lifts one or more feet up while outside, bring him/her indoors right away. Lifted paws mean "Ouch!" Java the labradoodle turned 2 years old today, so we gave her a Puppy Patty treat and she couldn't get it down fast enough. She must have been saying something we couldn't hear to the other dogs because nobody dared interfere! Note the hat is not on the head. That was Java's choice as well. "There's a limit to sharing," Crosby exclaims. 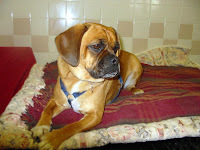 Today is Crosby the puggle's birthday and he somewhat unwittingly shared his puppy patty treat with his Doggie Den pals. However, when it came to the container, he set his paws down. Oh the weather outside is frightful, but the play inside's delightful, let it snow, let it snow, let it snow!! CAST OF CHARACTERS: Clancy the yellow lab; Cody the rust-colored lab mix; Emmy the gray and black mix; Noel the black lab mix; Remi the brindle bulldog; and Ringo the red/brown Aussie. You've met Crosby the puggle before. He loves dressing up for Halloween. Here he's posing for his "January Dog of the Month" photo. He's good at it, isn't he? Wait 'til he finds out that the honor includes a free bath and nail trim!